Hillary Clinton the presumptive Democratic Presidential nominee is ahead of the presumptive Republican nominee Donald Trump 47% to just over 42% in the most recent poll in the race for the White House released by a cable television operator. Only 22% of the registered voters polled said their minds might change before the November election. Clinton also leads Trump when Libertarian Party candidate Gary Johnson and Green Party candidate Jill Stein are added to the mix. Nationwide in that race, Clinton has 42%, Trump has 38%, Johnson has 9% and Stein is last with 7%. Neither Stein nor Johnson have guaranteed spots on the ballot in each state, but one or possibly both will be appearing in a number of competitive states such as Colorado, Ohio and Florida. More backers of Clinton said their minds are already made up, as 37% of all voters registered, are solid voters for Clinton. In comparison, only 33% of registered voters said they are definitely behind Trump. Amongst the voters who said they have not yet chosen a candidate in a race between Clinton and Trump, over a third chose Johnson 23% and Stein 12% in a race that is four-way. Clinton has an edge against Trump in a number of issues including immigration, foreign policy, trade, nominating Supreme Court justices and other issues related to women’s rights and for lesbians and gays. Clinton also is better able to take on the responsibilities of being commander in chief and exercising sound judgment during a crisis. However, Trump has an edge on two issues the many times top the priority list of voters: Terrorism and the economy with Trump holding a 3% edge in terrorism. He tops Clinton as well on gun policy and is seen as being slightly a stronger leader. 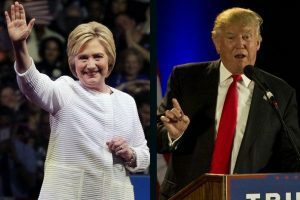 Even with the edge held by Trump in certain key issues, the majority says they believe Clinton will prevail in the November election with 55% saying they believe she will be victorious and 38% believe Trump will win. Each of the candidates has had favorability ratings that are mediocre and the new polls found there was little improvement for both. Each of the two candidates is viewed unfavorably by 6 of 10 voters. Neither of the presumptive nominees have universal support within their parties. Amongst Republican as well as voters leaning Republican 51%, support Trump, while 48% would prefer another candidate. For Democrats, 55% support Clinton as the nominee while 43% would prefer another candidate.